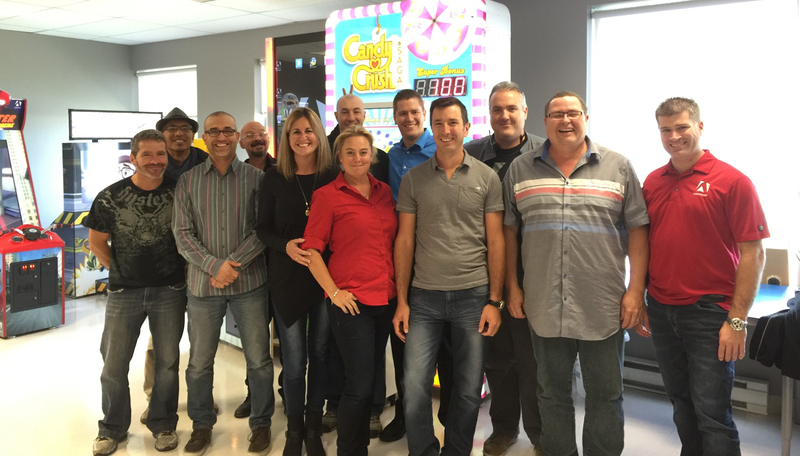 “Team Adrenaline” (from left to right): Stephane Brousseau, Sambath Laau, Nacer laras, Mike Morin, Solange Horth, Jonathan Chretien, Stephanie Pichette, Jonathan Deschenes, David Lachance, Jean-Pierre Paradis, Claude Gagne and Marc Andre Gauthier. The world of video games has seen its fair share of evolution, transforming from the massive hardware required for tiny, memory-cheap games of the ‘70s and ‘80s to today’s smart phones that run exponentially more complex games. That transformation hasn’t kept the basics of good gameplay from permeating throughout formats large and small, however, and a company like Adrenaline Amusements knows that well. The Canadian game manufacturer is well known for its early adoption of the idea that app-based games with millions of downloads could make for popular ticket redemption machines as well. With the use of receptive touchscreen technology, the company has upgraded and upsized massively popular games such as Crossy Road, Candy Crush, Fruit Ninja and more. That new product was Kaboom, a game the company built in 2010 that allowed players to take on the role of a demolition company and earn tickets tearing down structures. But, according to Francois, the business really took off when they got the green light from Halfbrick Studios to create a coin-op game based on its wildly successful Fruit Ninja later in 2010. “Recognizing the trend was so important. Fruit Ninja was the first mobile game that ported to the arcade world, and it was such an obvious and incredible game to put in the redemption format,” Francois said. The sales team: Francois Lachance, Jeff Evangelista, Mehdi Eghbal and Frank Ballouz. The company’s team started from scratch, but they have a foundation that rests on 15 years of core experience gained before 2010. David Lachance, Adrenaline’s president, has brought many technologies to the coin-op market throughout the years and continues to do so today. The team of executives helps Adrenaline’s products stand apart by their design and innovative components, as well as their go-to-market strategy. The company has an in-house software studio in Quebec that is fully integrated with their research, development and manufacturing. The salespeople work out of the headquarters in Canada, as well as Los Angeles, Chicago and Europe to ensure distribution throughout North America, Europe, the Middle East and Asia. A 60,000-square-foot Canadian factory is the heart of the company, where all of their games are built and assembled for shipping around the globe. Adrenaline’s software team work area. Besides marketing and providing service to their current lineup of games, the company has reliably released new content since they began in 2011, with 14 full-size arcade games available for purchase and even two mobile games of their own you can download on your smart phone. Their newest redemption pieces for the arcade are Snaky Tickets (a two-player take on the classic Snake game), Crossy Road (inspired by the app of the same name which was itself inspired by Konami’s 1981 arcade classic Frogger, brought to North America by Sega-Gremlin), and Flying Tickets (an arcade version of the headline-grabbing 2013 mobile game Flappy Tickets). Adrenaline has plenty in development, and is preparing for its exhibit at this year’s IAAPA Attractions Expo. Francois hinted at several new items they’ll be bringing, including a new game called Crazy Towers. This four-player, “holographic” game is an original from Adrenaline that challenges players to build the tallest tower possible, winning more tickets the higher they go. Francois says Adrenaline has been continuing to push up to four games out per year, and as the market is on an upward trend, believes they’ll have no problem keeping that pace. Adrenaline’s service team: Jonathan Deschenes , Mike Morin and Jean-Pierre Paradis. With that in mind, Francois believes the company has a lot to offer the growing market. With a finger on the pulse of app-based gaming and deep, rewarding ties to many successful developers, as well as an in-house team of content creators, he feels the company is ready to create the newest way for people to have fun playing arcade games. For more information on Adrena­line, look at their website at www.adrenalineamusements.com or swing by their IAAPA booth (#210) for a look at what new games they have to offer.